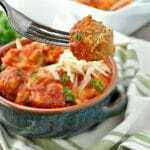 A super easy and comforting Italian meatball and ravioli casserole made with just 10 minutes of prep work. Comfort food that the whole family will love. 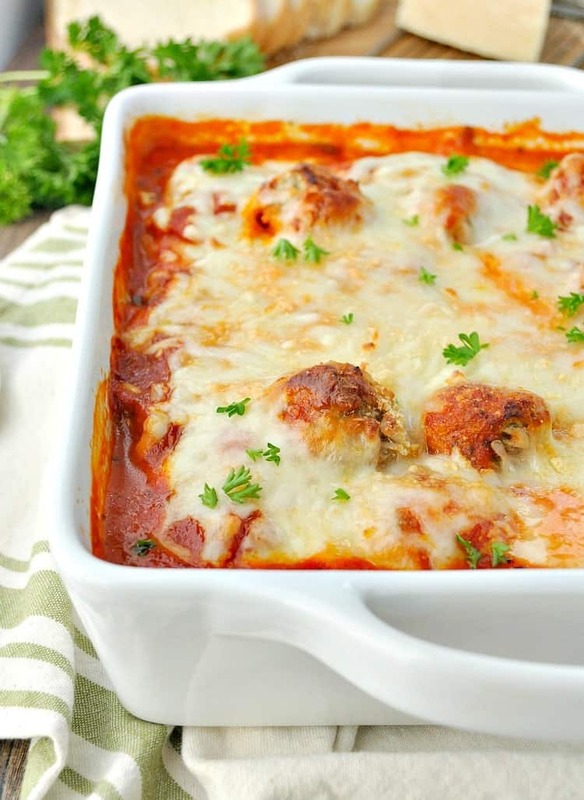 There’s no need to boil the pasta or cook the meat for this Dump and Bake Meatball Ravioli Casserole! With only 5 ingredients and a few minutes of prep, you’ll have a family-friendly one dish meal that’s ready for the oven. 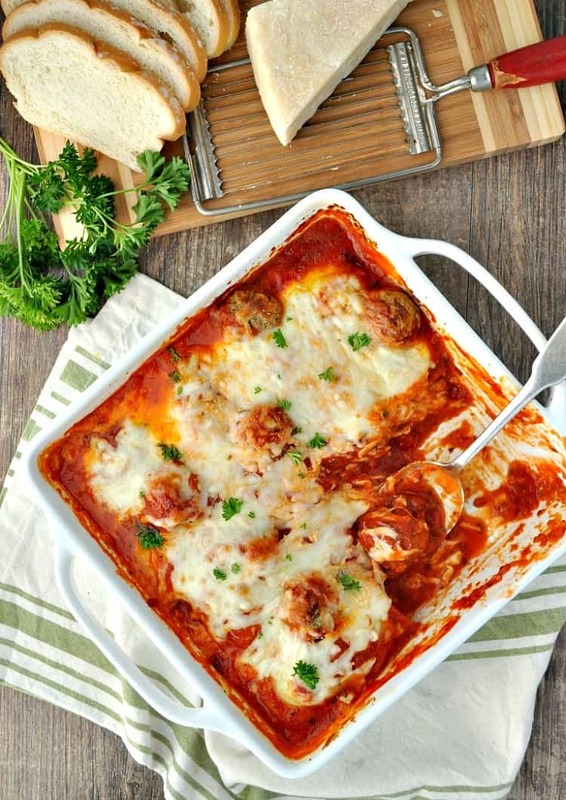 This easy dinner recipe is a great way to simplify your busy weeknights! 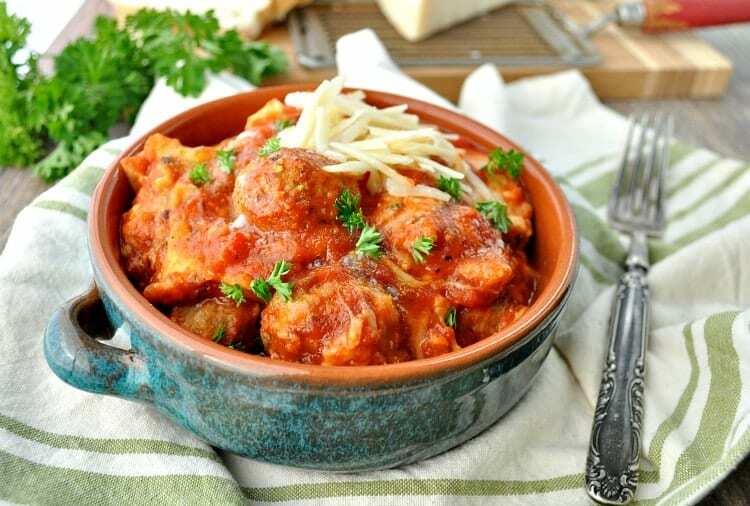 If there’s one cuisine that the four boys in my house can agree on, it would definitely be Italian food. No matter how I fix it or what I stir into the mix, my hungry little guys will always polish off a bowl of pasta with marinara sauce! But you know what? There are plenty of evenings when I don’t feel like cooking, or I don’t have time to pull together an elaborate dinner (that would be most nights, in fact)! That’s why I have become quite proficient at creating recipes that require minimal ingredients and minimal prep time, but deliver on maximum taste. 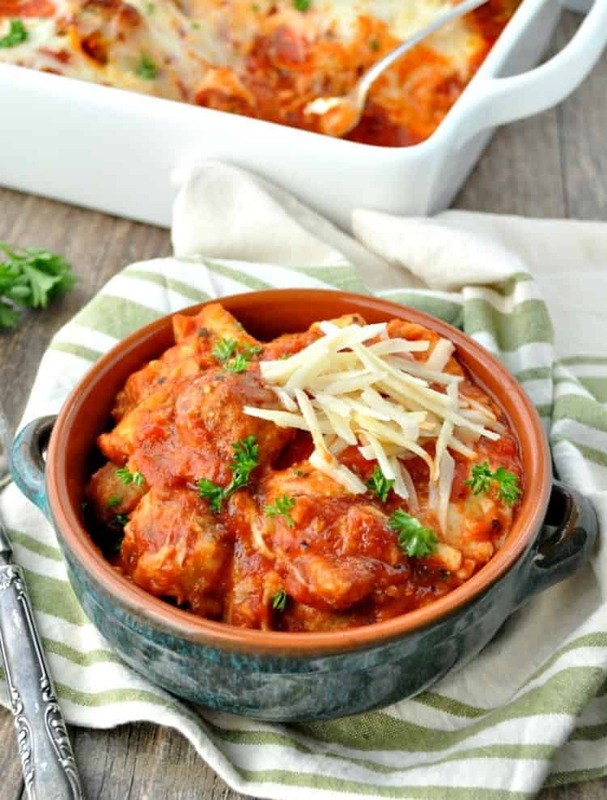 This ravioli casserole is definitely one of those gems! 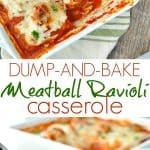 Let me just make this very clear — you literally DUMP the ingredients into your casserole dish in a couple of different layers. There’s no measuring necessary (eyeballing it is fine! ), no mixing bowls to wash, no extra pots to scrub, and no additional prep work. Just pop your frozen ravioli right into the oven and they will cook beautifully in the pan as they soak up all of the flavor from the sauce. I know that it sounds too good to be true, but I promise — your family is going to love this dinner! Now, if you want to get fancy and really impress your guests, just add a little bit of torn fresh parsley or basil to the top of your casserole right before serving. It’s a 20-second trick that gives the meal a pop of color and freshness. Enjoy, friends! Preheat oven to 400 degrees F. Spray a 9-inch by 13-inch baking dish (or two 8-inch dishes) with cooking spray. Pour about 1/3 of the marinara sauce (12 ounces) in prepared baking dish to cover bottom. Arrange half of the frozen ravioli in a single layer over the sauce. 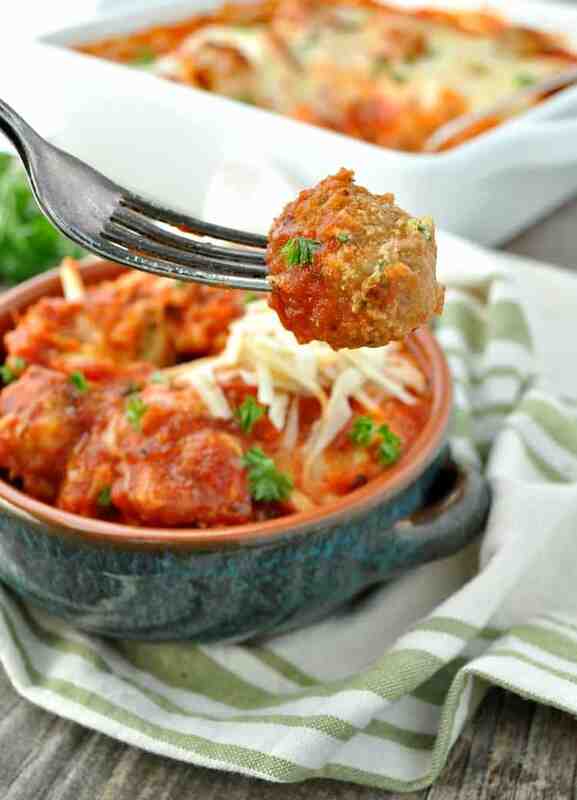 Top with half of the meatballs. Pour another 1/3 of marinara sauce (12 ounces) over top. Sprinkle with half of the mozzarella cheese. Repeat layers once, starting with ravioli. Sprinkle Parmesan cheese on top. Cover with aluminum foil and bake for 20 minutes. Remove foil and bake, uncovered, for 20-25 more minutes or until bubbly and hot in center. Let stand 10 minutes before serving. Thanks for this easy meal idea… I don’t see any actual directions… you did say eye ball it and no measuring. I can figure that out but what temperature and how long do you bake to be sure your frozen ravioli are hot? I love simple and easy comfort food like this, yum!